Servants of Mary celebrate 125 years in U.S. The Order of the Servants of Mary was founded in the early 13th century by a group of seven wealthy businessmen in Italy. They left their homes and moved to Mount Senario, near Florence, to live their lives in prayerful community and service dedicated to Mary, Mother of Sorrows. The order is now worldwide and includes a variety of autonomous congregations of priests, brothers, third order members and lay associates. The U.S. congregation of the Servants of Mary is linked to Marie Guyot, a young French girl who led a group of teachers in establishing a school for girls in Cuves, France in 1842. These teachers formed a small religious community that moved to England a few years after Marie’s death in 1849. The group, then known as the Sisters of Compassion, worked with the poor and served as missionaries and teachers. They joined the Servite Order in 1864 and took their present name, the Servants of Mary of London/Cuves, at that time. In 1893, the first permanent foundation of the Servants of Mary in the United States was founded in Mount Vernon, Indiana. Servite Sisters began teaching in Nebraska, the home of their current Motherhouse, in 1918 and became established in other parts of the United States throughout the 20th century. In the mid 1920s, Father Timothy Holland, pastor of the recently built Sacred Heart Church in Massena, approached the Servants of Mary in Omaha and requested that they consider staffing a soon-to-be-built Catholic School. The Servites agreed, and a convent was also designed and built to house the sisters. 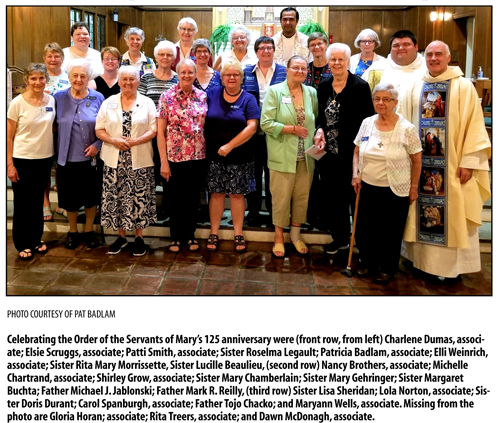 The Sisters of the Order of the Servants of Mary have served in Massena in various ministries since 1929. They taught at St. Mary’s School from 1929 to 1952, Sacred Heart Elementary/Junior High School from 1931 to 1993, Holy Family High School from 1961 to 1975 and at Trinity Catholic School from 1993 to the present. Sisters belonging to the Order of the Servants of Mary who were/are from Massena include Mary Alice Haley, Imelda Kirkey, Lucille Beaulieu, Rita Mary Morrissette, Rose Richey, Roselma Legault, Julia Staie, Lucy Bottosto, Mary Prairie, Virginia Holland, Mary Alice Murphy, Doris Durant, Mary Stephen Durant, Louise Genest, Veronica Marie Balazs and Juliana Fitzpatrick. In the latter part of the 20th Century, the Servants of Mary established a lay program known as the Servants of Mary Associates. Associates may be men or women, married or single, young or old. They share the mission of the Servites and work together with the Sisters in their various ministries. Currently, there are 12 Associates in Massena who work with Servite Sister Doris Durant. The local Servites volunteer at local health clinics and nursing homes, visit hospital patients and the homebound, serve as lectors, musicians, and extraordinary ministers, perform various parish duties, and work in bereavement ministry. The associates meet regularly with Sister Doris to pray and share their faith. On June 18, the local Servite Sisters and Associates gathered at the noon Mass at Sacred Heart Church to celebrate the 125th anniversary of their Order’s establishment in the United States. Father Mark R. Reilly celebrated the Mass with concelebrants Father Tojo Chacko and Father Michael J. Jablonski. They were joined by several Sisters from the Motherhouse in Omaha, Nebraska including Sister Mary Gehringer, US Community Prioress who also spoke at the Mass, Sister Lisa Sheridan, Associate Membership Director, Sister Lucille Beaulieu, Sister Margaret Buchta, Sister Mary Chamberlain, Sister Roselma Legault, and Sister Rita Mary Morrissette. The Order of the Servants of Mary Sisters and Associates are grateful to the Sisters who served in Massena and provided a beautiful example of compassionate presence as modeled by the Blessed Virgin Mary, mother of our Lord Jesus.